Any housewife can not imagine her life without such a reliable helper as iron. We all want to look neat and well-groomed, but without well-ironed clothes – it’s almost impossible. 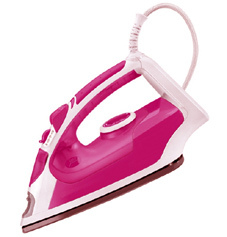 This article will tell you how to choose a good electric iron. Our grandmothers used large cast iron irons that were heated over an open fire and had fun around 2-3 pounds or more fairly recently. Electric irons, which have completely replaced their bulky predecessors, came into our life with electricity. 1. Power of iron (iron wattage). Iron use electrical power. Degree and speed of heating of iron depends on it power, consequently, the effectiveness of smoothing of clothes depends on it power too. Irons in power can be roughly divided into low power, middle power and high power irons. Irons with power up to 1000 Watts can be referred to a low power. This iron can be bought, if you iron not very often or you need to take iron with you on trips or somewhere else (travel iron), because low-power irons are predominantly small in size. Irons with power from 1000 to 2200 Watts belong to the iron with middle power. This is the main group of irons. Middle power irons represent the major percentage of sales. High power irons have electrical power over 2200 Watts. They are designed for more frequent and long-term use, also they are much more effectively for iron of any type of clothes. From other side high power irons consume a significant amount of electric power. For an average family I can recommend the purchase of iron with wattage 1800-2200 watts of power. On the material from which surface of iron made depends on how this iron will glide to the material, how it will keep the heat and how easy it will be to clean. There are irons with ceramic, teflon, aluminium and stainless steel surfaces. The most common type of surface coating is the stainless steel coating. Stainless steel surface treatment characterized by fairly well (though not the best) performance of slip, good resistant to damage and easy cleaning. To the disadvantage of this coating can be attributed fairly rapid surface contamination. Ceramic coating of surface usually used on expensive models of irons. It characterized by very high rates of slip, easy cleaning and gentle to the material. Disadvantage is the relatively low resistance to damage, as ceramic is rather fragile material. Teflon coating has a special care in relation to material that you iron, but it can be damaged very easy, therefore the irons with teflon coating is not very common. Aluminium coating can be found on the cheapest irons and its main advantage is the price. I can recommend to buy irons with ceramic or stainless steel coating of surface, depending on your budget. 3. The availability of steam. Steam on the ironing surface greatly increases the efficiency of the process of ironing. The presence of this feature in the iron can be considered mandatory. In most models steam is fed through the holes in the surface. – Protection from scale. This protection is provided by a special cartridge in iron or via a special button of automatic self-cleaning. – The presence of a “drop-stop” system. This system prevents the ingress of water droplets on your clothing when the iron is not warmed up but steam started. – The possibility of vertical steaming. Some irons can iron the clothes in a vertical position with this function. Protection from scale is a very desirable attribute, while the system “drop-stop” and “vertical steam” are the bonus functions. 4. Parameters of iron water tank. If the iron has a steam system, it must have a special container for water. Position of this tank should be maximum comfortable for water supply and it volume should be sufficient to ensure ironing without frequent refueling. I recommend to choose irons with volume of water tank at least 200-250 ml. – The length of the power cord. Opportunity to put the ironing board at a comfortable distance from your electrical outlet depends on the length of the cord. You can, of course, use an extension cord, but it is quite uncomfortable. Familiarized with the basic selection criteria, you will buy a good clothes iron and will always look neat and stylish with it. Very informative article. It was very helpful, thank you very much! very helpful tips for buying a right cloth iron box thanks..
All thr different types and features weren’t making a load of sense ?. Thanks for the info. This is very good article. what is the makers name for to purchase a clothes iron with all these good features. TEFAL, Philips and Braun are good makers of irons. Thank u ..it is too informative. Tahnk you for the information shared…. !